Photo courtesy of Butler University’s Public Safety webpage. Dylan Bakr is at his friends’ junior house almost every day. They play Mortal Kombat. They watch movies together. Last Tuesday, Oct. 17, they were all meeting up at the house before grabbing lunch at Atherton Union — before Bakr, a first-year computer hardware engineering and economics major, had to go to chemistry. Joel Van, first-year secondary education major, was visiting the house that day as well. “It took [Dylan] falling on the ground for me to realize what was going on,” Van said. 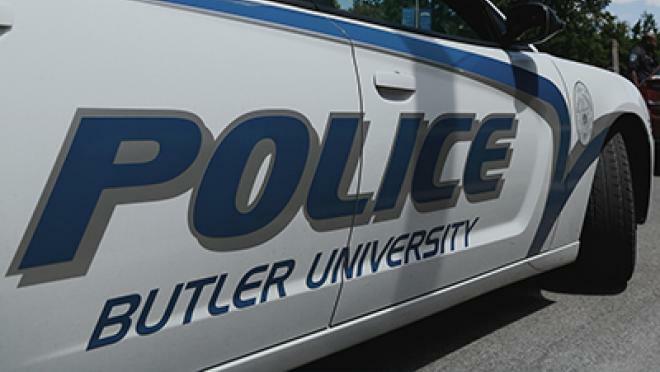 On that day, at 12:30 p.m. eight Butler students were victims of a residential robbery. The house is located close to Ross Hall and the Butler University Police Department. Three students live at the house, including juniors Casey Weider and Jamie Dorris. Dorris was coming from class when he approached a friend on the porch. She told him not to go in. One of the intruders had opened the door upon the friend knocking, and they told her to leave. Dorris, confused as to why he could not come in his own house, attempted to enter. Weider was the last one to show up. He entered through the back door, close to where he parked. Upon entering, he saw an unfamiliar face, then a gun was to the back of his head. “As soon as I realize what’s happening, I’m like, ‘OK, I want to get a good look at this guy’s face,’” Weider said. The two men stole everyone’s wallet and phone, along with the PlayStation 4, a pair of Beats headphones and Weider’s autographed baseball card he had since he was a kid. Car and house keys were also stolen, but Dorris’s keys showed up at the house on Weider’s car. His keys say “Chevy” on it, but he actually drives a different car. Weider drives a Chevy. He believes the men may have came back and tried to use Dorris’s keys to enter Weider’s car. BUPD officer Jason Downs reported he and other officers responded to the incident within five minutes of the call. But to Weider and Bakr, it felt like 20. Dorris said Sally Click, dean of Student Services, arrived before BUPD. Click said there were two police officers taking down information when she arrived. “We were just wondering how Sally Click was able to figure out so quickly and get over to the location,” Dorris said. Frank Ross, Vice President of Student Affairs, received the call from BUPD. Click offered to go. Click said it is standard practice for staff members from Student Affairs to connect with students involved in emergencies. She said Ross stopped by later that afternoon. “I wanted to be there to support the students and to assist them in the immediate response (without getting in the way of BUPD officers who were speaking with each individual involved),” she said in an email. Dorris said he was disappointed in the police response time. BUPD Chief John Conley said the time of the robbery was unusual. “There is a strong possibility that other people had seen something they didn’t think was too unusual, but looking back on now, may be pertinent information,” he said. Bakr said he wished those on campus were notified of the robbery sooner. Those signed up for Dawg Alert did not receive a notification on Oct. 17. Dawg Alert is Butler’s emergency notification tool. Users can sign up to receive alerts via text, email, call or all three. An email with the subject line, “Timely Warning” was sent to the university four to five hours after the incident. Julie Kopecka, first-year political science major, lives in Ross Hall, close to the junior house. She is signed up for Dawg Alerts, and said she had not heard of the incident prior to the email. Two thefts also occurred at the HRC that same day between 12 and 1:30 p.m. But Conley and Josh Downing, associate director of HRC operations, said they have no reason to believe the house robbery is connected. One person had a wallet and a phone stolen from the open cubbies in the workout area. The other had a wallet stolen from a bench in the men’s locker room. There was also another theft at the HRC on Sept. 8. Downing encourages visitors to take advantage of the free day lockers. Each locker room has 10 day lockers, and there are also some lockers by the main desk. “People have the opportunity to lock things up,” he said. But on Butler’s campus, Weider said, it’s common for students to feel safe — so safe they leave things unlocked. Dorris said they have always had an open door policy. There have been talks on campus of other house robberies since Oct. 17. Conley said officers have heard these rumors, but nothing has been reported to BUPD. The Collegian will continue to investigate and report on these incidents as we find more information.